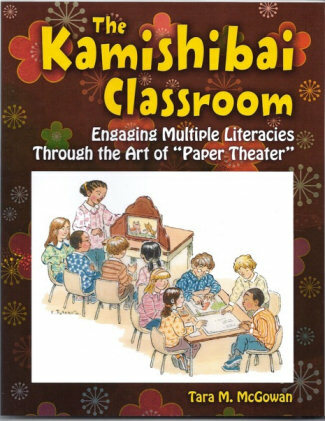 The Kamishibai Classroom, Engaging Multiple Literacies Through the Art of "Paper Theater"
We are thrilled to share the exciting news that Tara McGowan's book, The Kamishibai Classroom: Engaging Multiple Literacies Through the Art of "Paper Theater" has just been published. To view the Table of Contents, please click here. This cutting edge book introduces innovative ideas for using kamishibai story creation and performance as a teaching tool for students from pre-k through eighth grade. Tara has done extensive hands-on work with children of all ages in varied venues, from public school classrooms to community centers. The interactive workshops that she outlines in the book are an ideal way to get students involved in the fun and learning that occur when they create and perform original kamishibai stories. The Kamishibai Classroom is elaborately illustrated. Also, it provides step-by-step instructions for implementing kamishibai workshops in the classroom and integrating them into interactive performances. Tara M. McGowan is a doctoral candidate at the University of Pennsylvania in the Language and Literacy Division of the Graduate School of Education. Visit Tara online @ www.taramcgowan.com.